Boasts 28 Highway MPG and 23 City MPG! 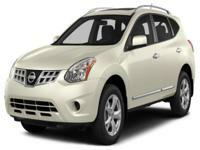 This Nissan Rogue boasts a 2.5L DOHC SMPI 16-valve I4 engine engine powering this Variable transmission. PLATINUM GRAPHITE, BLACK, SEAT TRIM, [L92] FRONT/REAR FLOOR MATS & CARGO PROTECTOR. * This Nissan Rogue Features the Following Options *[K01] SPECIAL EDITION PKG -inc: 16/ aluminum wheels, front fog lights, privacy glass, 4.3/ audio display screen, USB interface, rearview monitor parking aid, steering wheel audio controls, XM satellite radio, 6-speaker audio system, Bluetooth hands free phone system , [B93] REAR BUMPER PROTECTOR, [B10] SPLASH GUARDS, Zone body construction w/front/rear crumple zones, Vehicle security system (VSS), Vehicle dynamic control (VDC), Variable intermittent windshield wipers, Trip Computer, Traction control system (TCS), Tire pressure monitoring system. * Expert Reviews! *As reported by KBB.com: If the boxy look of traditional SUVs leaves you uninspired, the Nissan Rogue's shapely, sculpted exterior might be the answer you are looking for. Admirable fuel economy, affordable pricing and premium options combine to make the Nissan Rogue one of the most appealing small SUVs on the market. 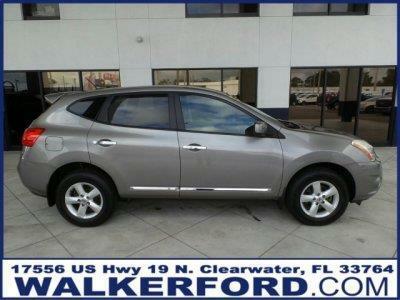 * Visit Us Today *For a must-own Nissan Rogue come see us at Walker Ford, 17556 US 19 N, Clearwater, FL 33764. Just minutes away! Walker IS Ford! Invoice Pricing? Employee Pricing? Tired of the gimmicks? Get the lowest price, the best customer service and HUGE selection every time at Walker Ford. Stop in today, we are conveniently located off US 19 in Clearwater, view the map for direction, and don't forget to check out our 5 star reviews while you're at it! Fuel Consumption: City: 23 Mpg|Fuel Consumption: Highway: 28 Mpg|Remote Power Door Locks|Power Windows|Cruise Controls On Steering Wheel|Cruise Control|4-Wheel Abs Brakes|Front Ventilated Disc Brakes|1St And 2Nd Row Curtain Head Airbags|Passenger Airbag|Side Airbag|Rear Spoiler: Lip|Digital Audio Input|In-Dash Single Cd Player|Audio System Memory Card Slot|Mp3 Player|Am/Fm Stereo|Radio Data System|Speed Sensitive Audio Volume Control|Total Number Of Speakers: 4|Braking Assist|Abs And Driveline Traction Control|Stability Control|Privacy Glass: Light|Wheel Diameter: 16|Wheel Width: 6.5|Urethane Steering Wheel Trim|Metal-Look Shift Knob Trim|Metal-Look Door Trim|Trip Computer|External Temperature Display|Tachometer|Manufacturer's 0-60Mph Acceleration Time (Seconds): 8.5 S|Power Remote Driver Mirror Adjustment|Power Remote Passenger Mirror Adjustment|Dual Illuminated Vanity Mirrors|Front Reading Lights|Anti-Theft Alarm System|Cloth Seat Upholstery|Bucket Front Seats|Rear Bench|Fold Forward Seatback Rear Seats|Tilt-Adjustable Steering Wheel|Speed-Proportional Electric Power Steering|Suspension Class: Regular|Interior Air Filtration|Manual Front Air Conditioning|Tire Pressure Monitoring System|Cargo Area Light|Max Cargo Capacity: 58 Cu.Ft.|Vehicle Emissions: Lev Ii|Fuel Type: Regular Unleaded|Fuel Capacity: 15.9 Gal.|Instrumentation: Low Fuel Level|Clock: In-Dash|Driver Seat Head Restraint Whiplash Protection|Head Restraint Whiplash Protection With Passenger Seat|Coil Front Spring|Regular Front Stabilizer Bar|Independent Front Suspension Classification|Strut Front Suspension|Four-Wheel Independent Suspension|Coil Rear Spring|Rear Stabilizer Bar: Regular|Independent Rear Suspension|Multi-Link Rear Suspension|Front And Rear Suspension Stabilizer Bars|Variable Intermittent Front Wipers|Steel Spare Wheel Rim|Spare Tire Mount Location: Inside Under Cargo|Chrome Grille|Center Console: Full With Covered Storage|Overhead Console: Mini With Storage|Curb Weight: 3|276 Lbs.